From over a million Robinsons Rewards Card (RRC) holders, Rose Ong was among those who least expected how far the card would take her. 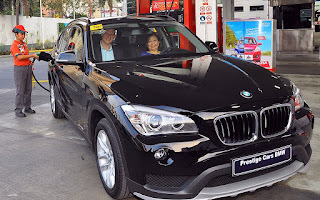 Even during the awarding held recently at the Caltex Malugay station in Makati City for the winner of the “Win a BMW X1” contest – the businesswoman from Quezon City still couldn't believe she'd bring home the luxury crossover SUV that's the dream car of millions. “I was aware of the promotion but never expected that I’d be lucky enough to win. When I got the notification letter, I immediately called them to verify,” Ong said. The latest collaboration between Chevron Philippines Inc. (CPI), marketer of Caltex with Techron and Robinsons Rewards, lets members earn one electronic raffle entry for every P 1,000 single receipt transaction at participating Robinsons Retail stores and Caltex stations from November 15, 2015 to January 15, 2016. The brand new BMW X1 came with P 100,000 worth of Caltex StarCash. CPI country chair Peter Morris, Robinsons Retail Holdings, Inc. president and COO Robina Gokongwei-Pe, and RRC brand ambassador Jessy Mendiola handed over the BMW X1 and the StarCash which can be used to purchase Caltex products to the overjoyed Ong, whose e-raffle entry was selected during the grand draw held last January 29, 2016. “Robinsons Rewards Card offers great perks, discounts and rewards points for shopping and fueling up at Caltex stations, but promos like this put the icing on the cake. This tie-up of Caltex and Robinsons Rewards Card encourages customer loyalty. I will certainly look forward to other great deals and surprises Caltex and Robinsons Rewards will offer as program partners,” Ong added. Using RRC to shop in any Robinsons store and to fuel up at Caltex lets members earn points which they can use to pay for purchases in Robinsons stores and get discounts in participating Caltex stations. Aside from the rewarding shopping and motoring experience, card holders get the five key benefits of Caltex with Techron which are maximized power, better fuel economy, smoother drive, lower emissions, and reliable performance. In addition to the grand prize, the Robinsons Rewards promo also gave away P 10,000 worth of Star Cash courtesy of Caltex to 10 lucky members who fueled up at Caltex stations, as well as P 10,000 worth of Robinsons gift certificates to 10 other winners. “Since CPI became the first external partner for Robinsons Rewards, we haven’t looked back. We share the same vision when it comes to delighting our loyal customers with the best rewards program in the market. This is a long-term partnership that will result in more win-win deals for everyone – CPI, Robinsons Retail and our customers,”added Gokongwei-Pe. Robinsons Rewards Applications Kits are available at any Robinsons store for only P 150.